A landscape is always a mix-and-match of various features and elements that add to its functionality, aesthetics, and value. It’s why homeowners install outdoor living features such as outdoor kitchens, pergolas, and gazebos. The latter is a very widely installed feature in residential landscapes and it looks stunning in every way. A wooden gazebo looks stunning in every way and it could be made of timber species such as redwood and cedar. These are resistant to moisture, very resilient and weather-resistant too. They are quite simple to work with and the final structures look very decorative and elegant and complement the look of different types of landscapes. A wooden gazebo made of very good quality cedar or redwood will add value to your home and lasts for a number of years as well. You can also opt for a gazebo made of treated pine, but this tends to be far softer than the other two species and isn’t as durable. Metal is a very strong and durable material that is used in gazebo construction. The two different types of metals that are commonly used in this feature are steel and aluminum though some gazebos may be made with wrought iron as well. The metal can be designed in a very intricate manner to create the type of gazebo you want. Aluminum is light and resilient and needs to be powder coated to enhance its durability. Steel is very strong but is a heavier material and you have the option to paint or powder coat it as well. Steel gazebos are best suited for larger landscapes as they are heavier structures. Some people want a unique design element in their landscape and they opt for custom-designed combination gazebos. These could be made with a wooden structure and metal roof or aluminum base and supports with a wooden roof or even a flexible roof like stretch vinyl or shade sail. These types of gazebos have their own appeal and they look great in any setting. 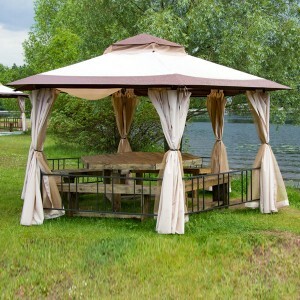 You also have the option to choose from canvas canopies or retractable roofing for your gazebo structure. As you can see, there are a number of different styles and materials to choose from. Though metal and combination gazebos look good, it’s difficult to beat the classic appeal of a well-designed, beautifully structured wooden gazebo. When you are getting this feature designed and built, you need to make sure that you source it from an experienced company. You might have to choose from a wide selection of models when you are looking for a gazebo for your property. This is why it’s a good idea to get advice from the gazebo installation experts like the ones at Cabanon Fortin. We have a number of different types of gazebos to suit your requirements.